MK120 Keyboard and Mouse. Product Model: MK120. Manufacturer: Logitech. A durable duo that brings comfort, style and simplicity together.Feel-good typing Your hands will enjoy the low-profile, whisper-quiet keys and standard layout with full-size F-keys and number pad.Rugged good looks The slim keyboard isn't just sleek it's tough with a spill-resistant design, sturdy tilt legs and durable keys.Smooth ride You'll be moving along smoothly with a precise, high-definition optical mouse to help you get around. Genuine UK Logitech | 3 Year Warranty! | FAST Delivery! Wireless Combo MK220. Product Model: MK220. Manufacturer: Logitech. Keyboard/Keypad Wireless Technology: RF. The compact keyboard is about 36% smaller than standard keyboards but still has all the standard keys-so doing the things you love is as easy as ever. Product Model: MK235. Manufacturer: Logitech. Like all batteries, your experience may vary based on the use and computing conditions.Built to last Durable construction with sturdy tilt legs and spill-resistant design. Product Model: MK330. Manufacturer: Logitech. Keyboard/Keypad Wireless Technology: RF. Pointing Device Wireless Technology: RF. Product Family: Wireless Combo. Product Type: Keyboard & Mouse. Product Line: Wireless Combo. Lucas Oxygen Sensor. Compact keyboard with full-size keys and wide, curved space bar. Lambda Sensors. Spark Plug Tools. Glow Plugs. Spark Plugs. DIY Car Service Parts. Denso Glow Plugs. The mouse is compact in size and has an extended battery life of up to 12 months, whilst the keyboard will last for up to 24 months without changing the battery.10m rangeKeyboard with 8 customisable keysCompact mouse with extended battery life of up to 12 monthsKeyboard battery will last up to 24 months. Desktop MK120. Product Model: MK120. Manufacturer: Logitech. Localization: Greek. Product Type: Keyboard & Mouse. Keyboard/Keypad Host Interface: USB. Pointing Device Host Interface: USB. Keyboard/Keypad Connectivity Technology: Cable. Desktop MK120. Product Model: MK120. Manufacturer: Logitech. Localization: Turkish. Product Type: Keyboard & Mouse. Keyboard/Keypad Host Interface: USB. Pointing Device Host Interface: USB. Keyboard/Keypad Connectivity Technology: Cable. Logitech MK330 Wireless Combo Keyboard and Computer Mouse, UK QWERTY Layout - Black. Series Wireless Combo MK330. Logitech Wireless Combo MK330 - keyboard and mouse set. Logitech Advanced 2.4 GHz wireless connectivity gives you the reliability of a cord plus wireless convenience and freedom-fast data transmission, virtually no delays or dropouts, and wireless encryption. Keyboard layout QWERTY. Mouse included Yes. Plug and Play Yes. Colour of product Black. Technical details. Feature Product Features. Special features. Condition: New. Missing Information?. Catalogue Number: 1931174. No learning curve involved. Type as long as three years between battery changes and use your mouse for up to a year before replacing the battery. Like all batteries, your experience may vary based on the use and computing conditions. Title: WIRELESS COMBO MK330. Condition: New. Missing Information?. Catalogue Number: LC03362. The durable Logitech® Desktop MK120 brings comfort. Logitech® Desktop MK120. A durable duo that brings comfort, style and simplicity together. Plus, it"s got easy-to-read keys. And setup is simple – you just plug your keyboard and mouse into USB ports and start using them right out of the box. 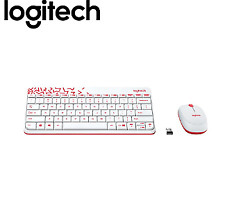 LOGITECK MK330 WIRELESS KEYBOARD AND MOUSE KIT Wireless combo with media shortcut keys This Logitech MK330 Wireless Keyboard and Mouse Desk set would make the perfect addition to your home or office. The ergonomic and cordless design of the keyboard makes it extremely practical and with the battery powered mouse suitable for right and left-handed use, it makes it very easy to navigate your way around the computer. ---Includes 11 multimedia hot keys and a Logitech Unifying Nano receiver. Features a comfort design. Wireless with a 10m range. 24-month keyboard and 12-month mouse battery life. ---Batteries required: 1 x AA for mouse and 2 x AAA for keyboard (NOT included). Keyboard: ---Black. ---Ergonomic design. ---Plug and play. ---Cordless. ---USB connectivity. ---Hot keys functions x 11. ---Programmable hot keys. Compact keyboard with full-size keys and wide, curved space bar. 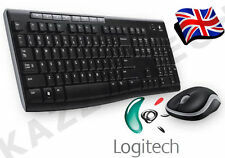 Logitech Wireless KeyBoard & Mouse Combo Set MK330 UK ENGLISH QWERTY in Black Colour. Logitech Part Number: 920-003986. UK English QWERTY Layout . This product carries a Full 3 Year Logitech manufacturers Warranty. Part Number: 475044. A battery life of up to 24 months for the keyboard and up to 5 months for the mouse allows you to enjoy the technology and not worry about replacing the batteries every week. Desktop Keyboard & Mouse - Wireless. Product Model: MK235. Manufacturer: Logitech. Product Type: Keyboard & Mouse. Localization: Czech. Keyboard/Keypad Connectivity Technology: Wireless. Pointing Device Connectivity Technology: Wireless. Logitech MK235 Keyboard & Mouse - Wireless - Grey Wireless - Grey. Product Model: MK235. Manufacturer: Logitech. Product Type: Keyboard & Mouse. Keyboard/Keypad Connectivity Technology: Wireless. Pointing Device Connectivity Technology: Wireless. INSTANTLY FAMILIAR. SIMPLY ADVANCED. The MK540 Advanced is an instantly familiar wireless keyboard and mouse combo built for precision, comfort, and reliability. MK540 Keyboard & Mouse. Product Model: MK540. The cordless optical mouse features Tilt Wheel Plus Zoom. Secure, high-performance cordless. WE WILL BE HAPPY TO WORK OUT ANY PROBLEMS/ISSUES RELATING TO YOUR ORDER. Includes optical portable mouse with tiny Logitech plug and forget receiver. 24 month keyboard and 12 month mouse battery life. Keyboard layout: QWERTY. Enhanced 2.4 GHz wireless with 10 m range. Long-range wireless. Logitech Wireless Combo MK330. Logitech Wireless Combo MK330. And you can also take the portable, comfortable mouse wherever you go. Portable mouse with tiny Logitech unifying receiver. Logitech 2.4 GHz wireless connectivity with a 10 m (30-foot) range. Product information MK270 Wireless Desktop Keyboard and Optical Mouse. Specifications MK270 KB/Mouse. Matching excellent quality ergonomic keyboard and mouse set. Optical mouse can be used on virtually any surface. This is part is manufactured by LOGITECH. Compact keyboard with full-size keys and wide, curved space bar. Logitech type MK270. 36-month keyboard and 12-month mouse battery life. Standard layout with full-size F-keys, number pad and arrow keys. Long life UV-coated, abrasion-resistant keys designed to last over 5 million keystrokes. With the Logitech Wireless Combo MK260, you get long-range wireless convenience with the reliability of a cord. You can go for months without battery hassles - 24 months for the keyboard and 5 months for the mouse . Logitech Unifying receiver. Advanced 2.4GHz wireless. Carry-around mouse. Extended battery life. Product information. Logitech Desktop MK120. A durable duo that brings comfort, style and simplicity together. With its thin profile, spill-resistant design, durable keys that can withstand up to 10 million keystrokes and sturdy, adjustable tilt legs, this sleek keyboard not only looks and feels good Ã?â? ?.